Colonel Muharrem Kose, a former officer in the Turkish Armed Forces was named by state-run Anadolu News Agency as the leader of the coup attempt against President Recep Tayyip Erdogan's government. The bloody coup attempt that struck Ankara on Friday now has a face — a former Turkish military officer who was dishonorably discharged in March 2016 for his alleged association with anti-government and US-based Imam Fethullah Gulen. Colonel Muharrem Kose announced the formation of the "Peace Council," an interim government to restore democracy and human rights in Turkey that Erdogan's opponents claim have been stripped from the country as it had begun to drift ever closer to a theocracy after long being adored as the secular gem of the Middle East. 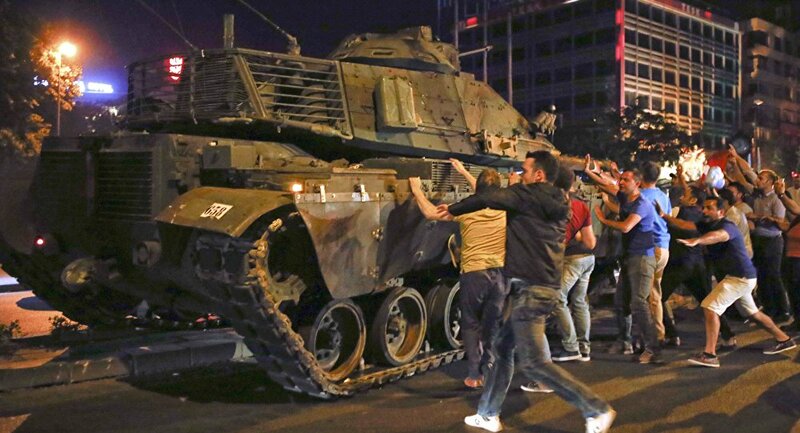 Military forces loyal to Colonel Kose seized the state-run TRT News station, the bridges, and Ataturk International Airport on Friday evening before being pushed back by Turkish forces loyal to Erdogan as bloody struggles have ensued throughout the country. ​It appeared that the coup effort had succeeded until President Erdogan took to CNN Turk, calling in via FaceTime, pleading with his countrymen to resist the effort to overthrow the government by taking to the streets. The move, initially mocked by Western media and leaders, appears to have been successful with millions of Turks taking to the streets to resist Colonel Kose's Peace Council. Turkish President Recep Tayyip Erdogan earlier in the day blamed supporters of the Pennsylvania-based Imam Fethullah Gulen, prior to identifying Colonel Kose as the lead agitator in the coup attempt. Despite Muharrem Kose's apparent links to Gulen, the Imam's non-profit, the Alliance for Shared Values, denies any involvement and has condemned "any military intervention in the domestic politics of Turkey." Gulenists are not hardliners as the Imam preaches a blend of piety and Sufi mysticism while calling for free markets, democracy and religious tolerance in keeping with the original vision of Turkey laid down by the country's founder Kemal Ataturk. Gulen's movement known as Hizmet, once boasted as many as 2,000 officers within the Turkish military prior to crackdowns by President Erdogan. Supporters of Gulen have long attempted to use the judiciary to advance corruption investigations against Erdogan sparking a bitter divide between the two groups. Turkish authorities accuse Gulen of attempting to form an opposing "state within a state" known by many in Turkey as the "Parallel Structure." Prior to being ousted for his alleged ties to the Gulenist movement, Muharrem Kose proudly served as the chief legal counsel to the Turkish military's chief of staff Hulusi Akar. Akar was taken hostage in the first hours of the coup attempt that began on Friday evening.